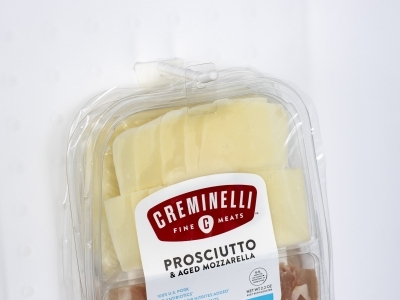 When Creminelli looked for a way to hang their “Fine Meats” line of meat & cheese products in store coolers, they found a solution with Do-It Corporation’s R-J27 Round Hole Hang Tab. Using Do-It’s standard 203A adhesive, the R-J27 aggressively attaches to the package and hangs securely in a store cooler. The roll form ejected hole hang tab is automatically applied with a Norpak Hang Tab Application System. This was a key feature that helped convince Creminelli to choose this hang tab for their product.